The NephJC went off on June 10th at 9pm eastern daylight time. Clinical practice guideline on diagnosis and treatment of hyponatraemia. Spasovski G1, Vanholder R, Allolio B, Annane D, Ball S, Bichet D, Decaux G, Fenske W, Hoorn E, Ichai C, Joannidis M, Soupart A, Zietse R, Haller M, van der Veer S, Van Biesen W, Nagler E; Hyponatraemia Guideline Development Group. Vaptan Discussion, a transcript about the CPG's recommendation against the use of Vaptans in hyponatremia. Though I was not aware of this before the tweet chat, this is not the first attempt at establishing clinical practice guidelines for hyponatremia, The American Journal of Medicine has published one on hyponatremia from 2013 by Joseph Verbalis et al. The guideline is available free here. It was sponsored by Otsaka the manufacturer of conivaptan, so reader beware. On June 17th, the NephJC took to YouTube and did a hangout with two experts in hyponatremia, Dr Hassan from the University of Chicago and Dr. Sterns from Rochester University. This is a follow up discussion from our Tweet Chat on June 10. Selected panelists will continue the conversation on the clinical practice guideline on diagnosis and treatment of hyponatraemia. This might be the first non-traditional subject for a journal club but it will not be the last. Journal Clubs typically discuss scientific articles, the clinical practice guideline is not typically featured in these discussions but the editors of NephJC see our mission to critically appraise and critique any document that is important clinical practice guidelines, review articles, editorials or even blog posts. This is the first non-traditional subject for a journal club, it will not be the last. The guideline was written by a consortium of the European Society of Intensive Care Medicine (ESICM), the European Society of Endocrinology (ESE) and the European Renal Association – European Dialysis and Transplant Association (ERA–EDTA), represented by European Renal Best Practice (ERBP). The guideline covers the diagnosis and management of hypo-osmolar hyponatremia in adults. The authors set out a specific hierarchy of outcomes that emphasizes patient oriented outcomes and deemphasizes biochemical targets. Data was collected up until December of 2012 for the guideline. They abstracted all of the data from the articles they examined into Excel spread sheets and they made those spread sheets available in appendix 6 and 7. These spread sheets are really impressive. It shows a tremendous dedication to gathering all of the data and making it publicly available. As we are seeing more and more, the CPG uses the GRADE system. Most of the guidelines are either, not graded or are 1D and 2D with a few 1C's. Section 5: A hyponatremia primer. Worth looking at. Well written and extensively referenced. 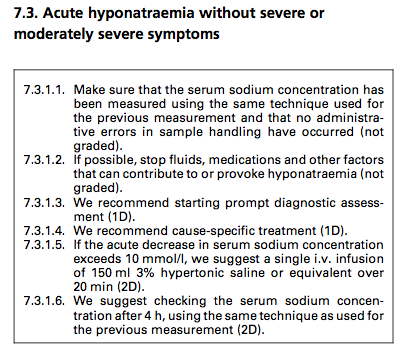 They also include a nice table of conditions that predispose to acute hyponatremia so if your patient fits one of these scenarios you should really consider an acute time course. Useful. One of my favorite part of the guideline was the discussion and recommendations for various tests for diagnosing the correct etiology of the hypo-osmotic hyponatremia. An excellent summary of the literature. The subtlety of the description is lost in the flow chart they provided to help people diagnose the etiology of hyponatremia. Section 7 is on the treatment. It starts off with a wonderful flow chart that is also a table of contents for the chapter. The treatment is divided according to symptoms. They covered the sickest patients first and moved to progressively less ill patients over time. The last section they cover is the concept of re-lowering the serum sodium if the sodium rises too quickly.